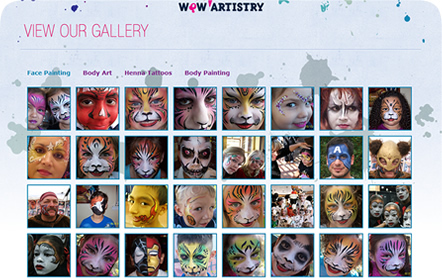 Based out of San Antonio, Wow Artistry is a professional face and body painting company run by award winning face painter Liz Alaniz with a knack for color and creativity. 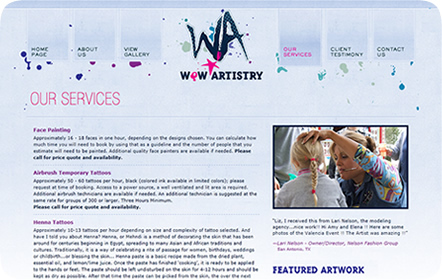 Wow Artistry can be booked to provide amazing, quality entertainment for both children and adult private parties, as well as corporate events, conventions, picnics and more. Ask any of her clients, you’ll be sure to receive nothing but high praise for her incredible skills and cheerful personality. 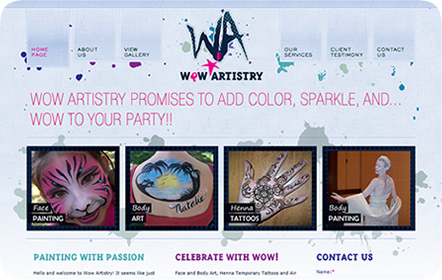 Wow Artistry was an interesting client for us because of the nature of Liz’s business. We had the freedom to be a little more wild and fun with her new logo, which became the inspiration for the website’s style. The navigation is unique, with color-changing bars and rollover animation as part of the design. The icon for her Facebook page is a little offbeat, angled on the side of the page in bright blue with paint splats surrounding it. We wanted Liz to stand out from the crowd, and she certainly has: we took her from being an independent, one-person hobby to becoming a relevant and well-known company in San Antonio and the surrounding areas. It made us stand out too, since we won a Bronze Addy with this website in 2011.